American Pro Building Products by Patwin debuted their new Cellular PVC rail system at the Deck Expo in Baltimore. One of the unique components is the “Living Finish”top rails. American Pro Building Products by Patwin debuted their new Cellular PVC rail system at the Deck Expo in Baltimore. One of the unique components is the “Living Finish” top rails. 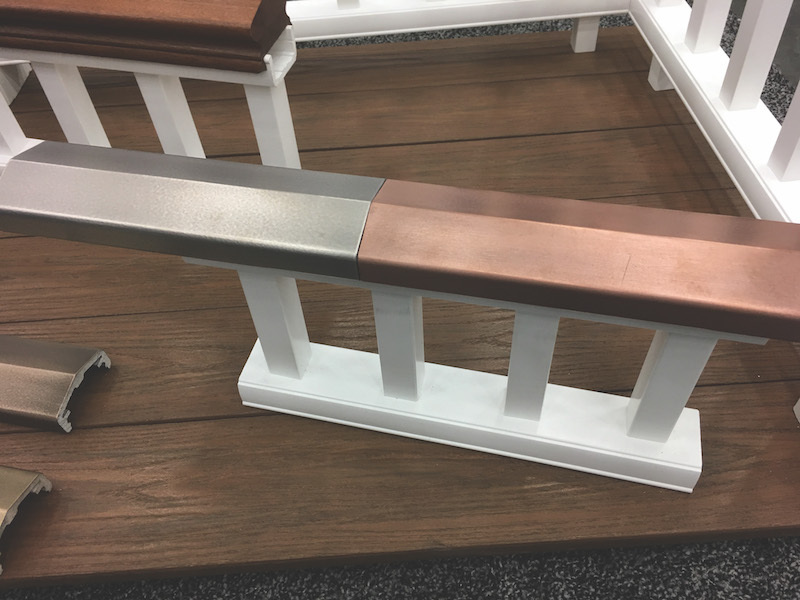 The Living Finish option gives you top rails with the classic look of metallics: Bronze, Copper, and Stainless, as well as real Mahogany, but at a fraction of the cost. The rails install the same as standard white ones, but give the rich look of real metal. They are strong, fade resistant, and UV stabilized for outdoor use. The next generation of PVC rail systems is here now! American Pro’s new Living Finish premium top rail gives you the look, feel and durability of real metal and wood. Enhance your lifestyle, at a price you can live with!